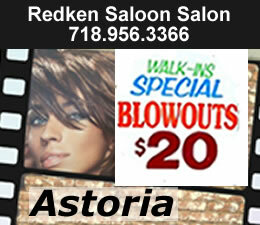 September 10, 2012 / Astoria / Queens Community Issues / Queens Buzz. 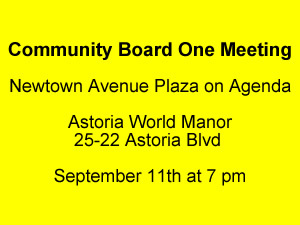 On Tuesday evening September 11, there’s a Community Board 1 meeting at the Astoria World Manor on 25-22 Astoria Blvd. 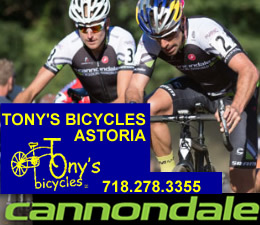 One of the topics on the agenda is which DOT [Department of Transportation] proposal to approve, regarding changing the traffic configuration in and around the intersection of Newtown Avenue and 30th Avenue in Astoria. According to the Queens DOT, this intersection is the site of numerous accidents, and is more dangerous than approximately 90% of all intersections in Queens. 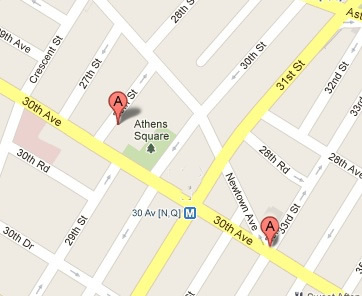 It’s not difficult to understand why, as it is the nexus point for five roads: east & west on 30th Avenue, north & south on 33rd Street and northwest on Newtown Avenue [see map on next page]. 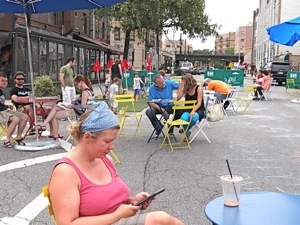 The photo to your left was taken on August 25th when Newtown Avenue was temporarily converted into a pedestrian plaza. Click here to read our report on the Newtown Plaza, in which we include related reports on other pedestrian malls in Queens, NYC and NYS. September 10, 2012 / Astoria / Queens Community Issues / Queens Buzz. There are two change proposals on the docket. One of them would convert a part of Newtown Avenue into a pedestrian mall at a cost of $75,000. 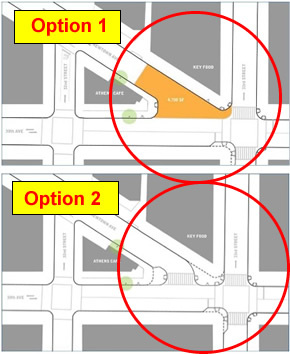 This option would convert more than half of the block on Newtown Avenue between 32nd and 33rd streets into a pedestrian mall, prevent traffic from accessing Newtown Avenue from this intersection and eliminate about seven parking spaces. This proposal could be completed this fall. The second option would extend curbs at a cost of $400,000, save the seven parking spaces and continue to allow traffic to pass through Newtown Avenue. This option could be completed in the Spring of 2013. See graphic depiction of each option on your right. 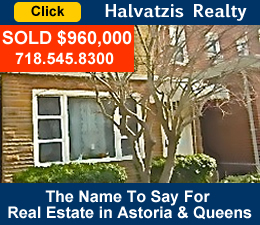 So what’s the best option for Astoria? We took a look into the history of pedestrian malls to see if there might be evidence in support of or in opposition to the creation of a pedestrian mall. Over the past couple of decades, there’s been a movement to reignite pedestrian traffic in NYC and cities around the nation in downtown areas. In the photo to your right are two Queens DOT representatives who fielded community questions about the possibility of a Newtown Avenue pedestrian mall on August 25th, 2012. Pedestrian malls have both succeeded and failed in attracting people into business areas, and the strongest correlation seems to be whether there is ample pedestrian traffic upon which to build. For example in 1984 in Buffalo, they implemented a ten block long pedestrian mall in hopes of bringing traffic back into an empty downtown area and it failed with vacancy rates climbing and property values declining. But in Times Square in NYC, the temporary implementation of a pedestrian mall in 2009 succeeded in reducing accidents and speeding up traffic; and it became a permanent pedestrian mall in 2010. 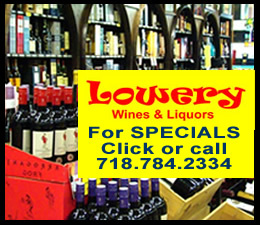 In Little Italy in NYC, the implementation in 1997 of a temporary summertime pedestrian mall along Mulberry Street provides a general boost to business in the area according to the Little Italy Merchants Association. The summertime mall begins Memorial Day and ends Labor Day. In Queens, the implementation of a pedestrian mall in Jackson Heights at 37th Road and 74th Street was at first opposed by local businesses. This change was implemented in October of 2011 along with numerous other simultaneous changes which were made to reduce congestion in the area [see prior Queens DOT story]. According to the Queens DOT, because of the rerouting of some of the bus stops, some of the local businesses lost built-in pedestrian traffic flow. 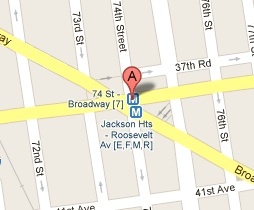 In the map to your left is shown the location of the pedestrian plaza in Jackson Heights [between 73rd and 74th street along 37th Road]. 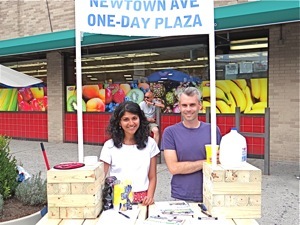 According to City Councilmember Danny Dromm, as of September of 2012, many Jackson Heights local businesses have come around from opposing the Jackson Heights pedestrian plaza [nicknamed Diversity Plaza], to endorsing it. 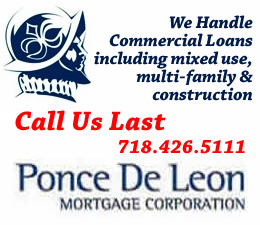 In fact, the local businesses have begun organizing a group [Sukhi NY] to help program events in the plaza. Sukhi is an acronym for Social Uplift Knowledge & Hope Initiative and loosely translated it also means prosperity & happiness in the Hindi & Urdu languages. 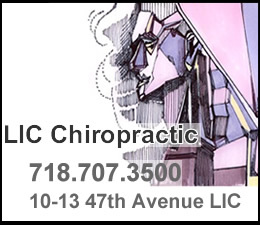 It’s worth mentioning that the plaza is a stone’s throw away from the 74th Street stop along the number 7 subway line. 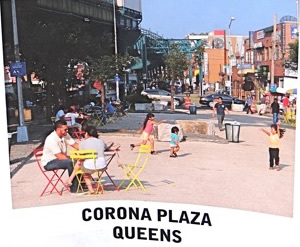 It’s also worth mentioning that the Queens DOT recently implemented a second pedestrian mall / pedestrian plaza at 103rd Street alongside Roosevelt Avenue in Corona called Coronas Plaza. The Queens Museum of Art and the Immigrant Movement International are working on art installations for the plaza. 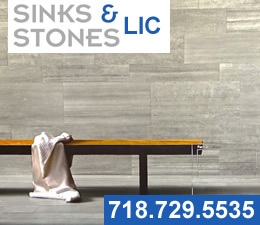 This plaza is also only a stone’s throw from the #7 subway stop. 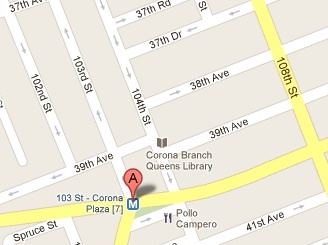 In the photo to your left is a marker showing the location of Corona's Pedestrian Plaza in Queens. Pedestrian Plaza In Sunnyside - Pedestrian Mall at 46th Street? The Sunnyside Shines BID has hosted summer streets festivals on 46th Street between Queens Blvd and Greenpoint Avenue for the past couple of years. 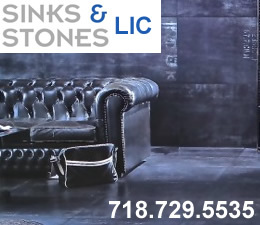 The popularity of these events is impacted in part by the weather, but the location doesn't significantly disrupt traffic and it's a stone's throw from the #7 subway line. The store owners along this block also aren't interested in the creation of a pedestrian mall. According to urban planners, three things are important to the success of a pedestrian mall: 1) built in pedestrian base upon which to build, 2) automobile access into and out of the area and 3) critical mass of interesting shopping and dining venues. The photo to your right was presented by the Queens DOT at the temporary mall in Newtown Avenue in Astoria on August 25th. Based on a non-scientific but random survey, it seems that pedestrians in the area want the pedestrian plaza option, while business owners in the area want the option that retains the nine parking spaces. We asked people in each group why they supported or opposed the pedestrian mall. Business owners cited loss of parking for paying customers, many of whom use cars to get into and out of the area. One store owner noted that parking was already very tight in the area and the loss of any parking space woudn't help. We mentioned a Queens DOT Study that showed that about 9 of 10 grocery shoppers in the area were pedestrian. The store owner noted that 95% or more of the businesses in the area sold other things, and that the real shoppers tended to be those who came in automobiles which they used to carry their goods home. 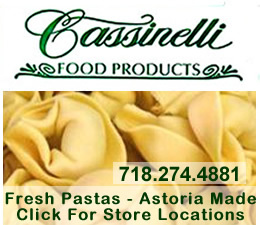 The store owner said that the economic climate is very competitive and Astoria businesses are competing with shopping malls that generally provide free and easy parking. I asked one of the pedestrian advocates for their rationale. They said they were for the pedestrian mall because it would enhance the quality of life in the neighborhood. They said it would provide a sort of town plaza / town center for residents to congregate in on special occasions, like a Christmas tree lighting. He also said that the move to smaller cars and muni meters would likely offset the seven parking spaces lost. So which option is best for Astoria? 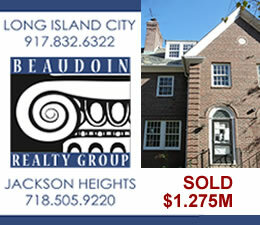 That is to be decided, quite possibly at the Community Board 1 meeting at the Astoria Manor at 25-22 Astoria Blvd on Tuesday, September 11th.